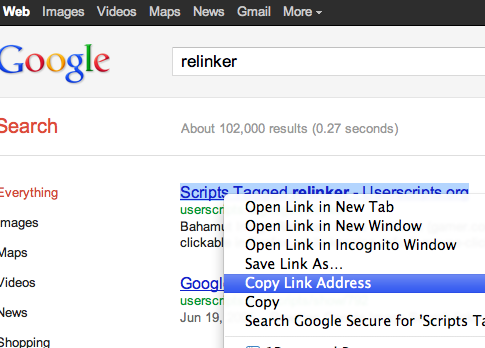 Where can I find a google search results re-linker for Google Chrome that works? BONUS: If the script works on google image search or if you have a separate one that would also be REALLY great. Prevents passing referrer to third parties, removes redirect trackers, resolves short URLs, and more. This extension attempts to prevent passing referrer data through links to third parties by adding noreferrer to the rel attribute. It detects page changes, so that links will still get processed for pages like Google's Instant Search or infinitely scrolling pages like Twitter and Facebook. Install both of them and using Google should become much less annoying! Where can I find an updated Google filter Greasmonkey script? How to disable Google search result link redirect (on right-click) in Chrome? Web browser extensions for Chrome & Opera that bypass redirect links in Google Search? In Chrome, Google search reverted to the old format. How do I change this back to the new format?